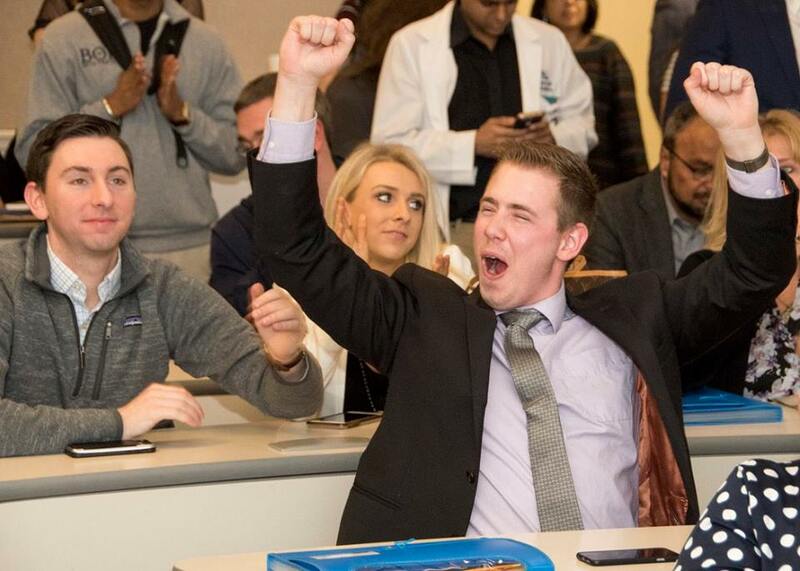 UMKC School of Medicine sixth-year student Jacob Rash was filled with excitement as the Class of 2018 celebrated Match Day, along with thousands of medical students across the country on Friday. An early morning rain shower couldn’t dampen the Match Day excitement throughout the UMKC School of Medicine on Friday, March 16. Students gathered with family and friends to fill all three of the school’s theaters to open letters from the National Residency Matching Program. Inside the envelopes, the learned where they will be going in a few months to begin their medical residencies. This year’s graduating class will be disbursed throughout 31 states and the District of Columbia for residency training. Internal medicine was the most frequent match with 27 residencies. Other popular matches were pediatrics and medicine-pediatrics (11), general surgery (9), psychiatry (9), family medicine (8), emergency medicine (7), anesthesiology (6) and orthopedic surgery (4). Thirty-three of the residency matches are in the Kansas City area, mainly through UMKC and its affiliate hospitals, but also at the University of Kansas. A half-dozen are in St. Louis, and four are at University of Missouri-Columbia. As the soon to be residents celebrated with classmates, some reflected on their time at the School of Medicine and shared their Match Day thoughts about what lies ahead. Why did you come to UMKC School of Medicine? On interview day, when I first got here, I saw how close everyone was, the camaraderie among the docents and the students. It felt like a very comfortable environment. I’m from New York and didn’t want to be that far from home, but I felt like this would be a second family for me, and it has been. What is your fondest memory of medical school? Definitely hanging out with my unit. Red 2 – the best unit ever! What did you the night before to prepare for Match Day? I worked out. Kind of got the stress out, all the pre-game jitters. Just kind of relaxed. This was the one specialty where I felt like I could make the most difference. I love taking care of people’s eyes. I think sight is the most important sense and to help someone see and maintain their vision is important. Just taking the next few months to hang out with as many people as I can, soak up as much of Kansas City as I can. Knock a few things off the bucket list and enjoy this place as much as I can before I leave. I knew I wanted to be a doctor, and I really liked that the program was accelerated. The clinical experience is really strong here. I’m very motivated by seeing immediate results, so being part of a group people motivated by patient care was important. And I liked that it’s a small class, so you get to know everyone in your docent unit and have a core group to lean on. What is your most fondest memory of medical school? I really loved the Do-Ro rotation with my unit. I also had really close roommates that I met in the dorms. We’ve been friends for six years. It’s been fun to get to know them through the bad times and the good, the study sessions and the long nights. Even though they were rough nights, they were great. What will you miss most about medical school and UMKC? I’ll miss my class and my friends, the docents and the really strong teaching atmosphere. It’s a hard program, but it doesn’t feel as hard when you have everyone working together. I like that there are acute problems that you can fix immediately. You go into the day with a checklist of things to do. You get those things done and you know at the end of the day, you’ve helped the patient. What did you do the night before to prepare for Match Day? My mom and my sister came in, and we got together and just relaxed. My roommate and I have been friends for six years. We said a quick prayer, relaxed and took deep breaths. Why did you choose the UMKC School of Medicine? It was because of the six-year program. That and my cousins went here, so I had some family that had gone through the program and really liked it. So, I decided to pursue it. What was your best memory of the UMKC School of Medicine? It has to be the friends I made throughout the years. It’s not really just one memory, it’s the journey that you’re on for six years. The close connections you have with friends are what I’ll remember most. How did you prepare for Match Day? I just stayed at home, drank a glass of wine and tried to relax. I’m flying to Las Vegas after this to meet my parents. I’m from Los Angeles, so it was easier for them to go to Las Vegas than to come here. In 10 years, I want to have my own practice with my sister as my physician assistant. Why anesthesiology as your specialty? My mom is a nurse anesthetist, so I had some early exposure and just really fell in love with it. I’m on Dr. Keeler’s unit, so I have so many great memories. He is awesome. He’s an incredible docent and mentor, and we had so much fun, especially on Do-Ro. What will you miss most about UMKC and medical school? I’ll miss all the friends that I’ve made over the last six years because we’ve become really close. Did you do anything special last night to prepare for Match Day? My family came into town, and we all went out to dinner, went to a movie and just chilled. First, I’m going to finish this bottle of champagne (a Match Day celebration gift) and then join everyone at John’s Big Deck, so it’s going to be fun. Knowing that I’d be getting clinical experience from day one and knowing that I wanted to do medicine, I felt like this was the perfect place. And Kansas City is awesome. I think the UMKC School of Medicine is one of the best programs in the country. I would do it again every time. I like treating patients of all ages, from babies to older people, and doing procedures. So, this was a natural choice for me. What will you remember most about medical school? Meeting all my friends and making another family, another home here, and getting to do what I love. I’m from California. Coming from Los Angeles, I was skeptical that I’d be able to call this a second home, but I really have and have come to love this city. I’m going to miss everything about it, the doctors, the administration. This is just such a nurturing environment. I came out of high school and everyone here has helped me grow into who I am today. I realize that I would really love to be involved in academics. I’d love to be involved with this school again one day. We’ll see, but right now, I think that sounds like a good plan. Why did you come to the UMKC School of Medicine? I grew up in California and my parents actually moved to Kansas City when I was 16 so they could help me get into the six-year program here. It was a family decision. My most fond memory would probably have to be meeting my boyfriend, Minh. I wanted a specialty that gives me a lot flexibility to do whatever I wanted. After residency, I could be a hospitalist, I could be doing sports medicine, I could be doing anything I want to. We’re all going to go to John’s Big Deck, it’s one of our traditions at the med school. Why did you come to UMKC for medical school? I was at the University of Missouri-St. Louis and I got an interview here at the UMKC School of Medicine. They said “yes” and I wasn’t about to turn it down. I love the procedural aspect of it and the fact they tend to take care of sicker patients. It isn’t as much rounding, it is more doing. What is your best memory from medical school? They’re all surgeries, being in the operating room. The first case that I ever scrubbed in for was a whipple procedure, which is a really long procedure, eight or nine hours. I was in dress shoes because I hadn’t dressed properly for the day. I loved it. I was there uncomfortable in my dress shoes for nine hours but I was like, yeah, this is for me. How are you going to celebrate your residency match? I’m going to go out with my family for lunch and then I’m going to go out with my girlfriend, Isha Jain. She graduated (from the UMKC School of Medicine) last year and is in her first year of family medicine in Chicago. So, I’m going to hang out with her. I’ve lived in Missouri for 13 years and wanted to stay in the area. I loved the idea of the accelerated program at UMKC. I always knew that I wanted to be a doctor, so this was the best way to go. I like everything, so I wanted a specialty where I could learn about everything and do everything. I don’t want to limit myself. What will be your fondest memory of the UMKC School of Medicine? Probably Match week, celebrating with all my friends, celebrating all of our accomplishments. I’m from Kansas City. I knew about the school and knew that I wanted to be a doctor, so it made sense to come here and do what I wanted to do. My favorite part about medicine is being able to deal with chronic conditions and being able to find the right medication that works for the patient. What is your best memory of medical school? Today. It’s a combination of all the fond memories, even the bad memories, all coming together in one day. It’s awesome. This is a bittersweet time. Everyone’s happy because they’re getting the residencies they want, but also a lot of people are going away. My best friends are leaving, going to other cities, so it’s cool that they get to do what they want, but I’m going to miss them. How did you spend the night before Match Day? I worked in the emergency room. I had an emergency medicine shift in the evening.